Grow your business with compelling professional-quality video that we create with photos, video clips, text overlay and your choice of music to fit your business needs and share it with the world. Video is the most effective way to put social media and your business advertising around the globe to work for you. Time is money. Get results fast. We produce incredible results that rival big-budget productions without the expense and delays. 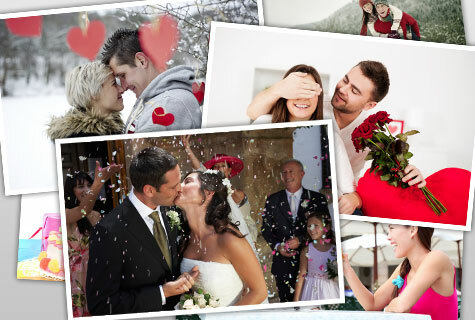 We create beautiful personal video montage for any occasion, whether it is for yourself, your family or your friends. Our Video Montage technology analyzes your videos and photos and music to make a fully produced and edited customized video. We create stunning, professional photo slideshows on DVD with music. We make it easy to transform your cherished printed photos, digital images, videos and printed memorabilia into spectacular, permanent, one-of-a-kind DVD slideshows that will last a lifetime. Any event or special occasion such as weddings, birthdays, travel, vacations, anniversaries, graduations, new babies, etc., can be preserved and made into priceless, dynamic photo DVD slideshows. Our DVDs will play on any DVD player. Or, we can provide a video file that you can watch on your computer, smart phone or tablet. We don’t just put your photos onto a DVD. We tell your story…we make it personal! Each DVD slideshow is custom-made for you. We take your photos, videos, slides and personal printed materials, then we add Hollywood-style special effects, transitions, motion, captions and other features to create an unforgettable photo slideshow on DVD. We can add the music of your choice to transform any event or occasion into a spectacular, timeless slideshow on DVD that you’ll want to watch again and again. We work hand-in-hand with you to tell your story and make your DVD slideshow everything you envisioned.